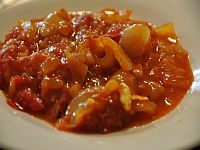 Lecsó, Lečo, Letscho or Leczo is a savory Hungarian vegetable stew, whose base consists chopped onions, pepper and tomatoes. Slices of sausage, such as Debrecen Wurstchen or Hungarian klobasa can be added. 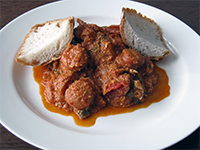 An egg may be dropped into the finished stew to thicken it. Lecsó is a very colorful dish. Because of the different color peppers that happen to be in season, it is a popular summer dish. Green, red, yellow peppers and tomatoes can be combined, giving the dish a very cheerful look. Relatives of the lecsó are the Peperonata from Italy, and Ratatouille from Provence. Heat the lard in a large pot over medium-high flame. Vegetable oil can be substituted, but the traditional way is lard. Add the onions and sauté until translucent and starting to brown. Add the garlic and sauté for another 1-2 minutes. Stir in the paprika until well blended. Remove from heat. Reduce heat to medium-low and return the pot to the flame. Stir in the peppers and continue to cook. Add the tomatoes last. Season with salt and pepper. Simmer for 20-30 minutes, or until the peppers are cooked through and soft. Add a little water if necessary to maintain a sauce-like consistency. At this point, the base is finished and the dish is basically ready to be eaten. If desired, add sliced sausage or kielbasa and continue to cook for another 5-10 minutes. If desired, thicken the finished dish with an egg, broken directly into the pot and mixed. Hungarian lecsó thickened with eggs..